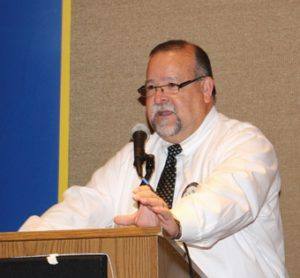 President Mark Burchill took aim as his gavel met the bell, signaling the start of our meeting, where ‘fellowship and service come together.’ The Pledge of Allegiance was sponsored by President Elect Nominee Jose Guillen. The Rotary Moment was delivered by Emily Harrington relaying her father’s advice to her when she faced some of life’s challenges – to change her attitude. She may not be able to solve all problems, but she can choose to change her attitude about them. Emily has changed her attitude about her attitude – all for the better. Our official greeters today ranged from ‘A to Z’ as in Secretary Jack Abercrombie to Past President Debi Zaft (if Debi’s parents were accountants, her name would be Debit Zaft). According to President Elect Nominee Jose Guillen, our visiting Rotarians were Roger Olson from the Healdsburg Club and Cal Parsons from the Avalon (Catalina Island) Club. Richard Lazovick (iTech Tutor) was a guest of Steve Marburger. 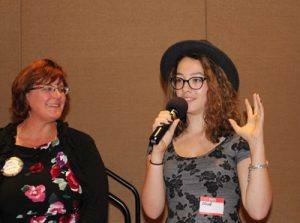 Chloe Mellier, our foreign exchange student from France, was the guest of Judy Glenn. Karen Ball introduced her guest, Barbara Kanowick. Wayne Rowlands introduced our speaker, Steve Lyman of the Santa Rosa Chamber of Commerce. Eileen Carlisle, our ray of sunshine, had good news that Past President Fred Levin is in recovery mode and coming along. Eileen shared that Glenda Sales, the president of the Rotary Club of Windsor, is in sick bay and would appreciate receiving good wishes by card or letter. We wish smooth sailing to both of them. Former Club member, Pete Magrini, had surgery and is in the local area and is recovering nicely (easy for us to say). President Elect Nominee (“PEN”) Jose Guillen (one busy guy today) who may be the Rotarian to hold the title of President Elect Nominee for the longest time, gave us a short lesson on what a PEN does. Right now, he is in the PITS (as in President-in-Training-Service). No one will be better prepared to serve as club President than Jose, when his time comes (July 2016). SHHH! SECRET GREETER AT WORK! Lena Humber was our secret greeter today and she selected Past President Peggy Soberanis as the greeter’s choice this week, for her great attitude. All you have to do is sit at the same table as Peggy to get some of her positive attitude that just leaps out to you. The winning marble is still lonely, even after Steve Reuter did his best to give it a home. The $193 pot carries over, minus the $10 consolation prize that Steve walked with. Raffle M.C. Robbie Fouts didn’t cry, knowing that next week he has a shot at the ever-growing raffle prize. Past President Debi Zaft scoured the crowd for an answer to this month’s Rotarian magazine question and she found that Ann Gospe had the correct answer. “Alzheimer’s disease” was the condition that had to have the right treatment applied to the right patient at the right time, to be effective. President Mark says we have two Bocce ball teams, but we need more fans for the May 30 event at Julliard Park. 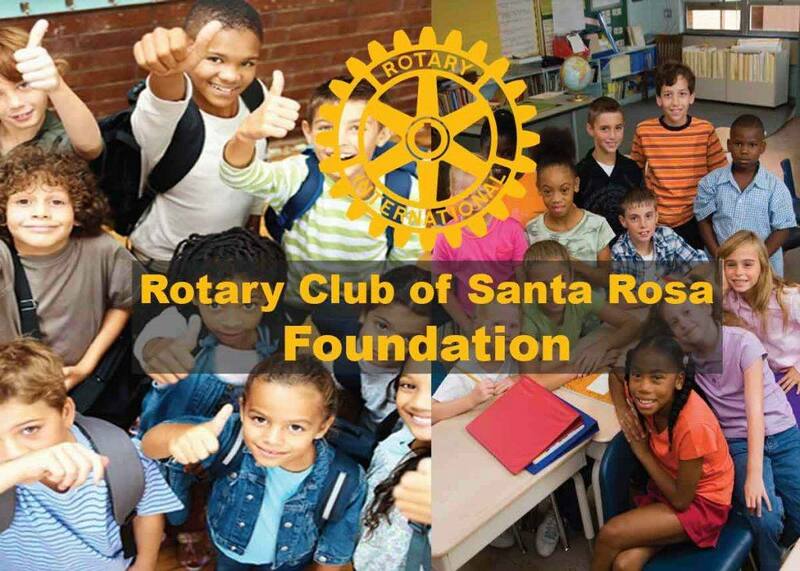 May 28 is the Santa Rosa Junior College celebratory lunch for the naming of the Rotary Hall on campus. Plan to attend. According to The Pied Piper of Pizzas, Wayne Rowlands, there will be a Rotary Means Business event on May 12 at the Shone Farm where we will celebrate the first pizza to be baked in their new pizza oven. Hopefully, celebrate is synonymous with consumption. Bring your best Italian buds (taste buds, that is). Ann Gospe (another really busy one) reminds us that the Giro Bello bike ride is fast approaching (last Saturday in June) and that more volunteers are needed – go to the club website for a link to volunteer sign-up. Chloe Mellier will be hosting a fund-raising French dinner at the house of Jeff and Ann Gospe on May 9 at 5PM. She will make the atmosphere match, as closely as possible, her family’s restaurant in France. Seating is limited to 24, so contact the Gospe’s quickly. Dinner tickets are $50 each or $90 per couple. It’s a fun-raiser, too, so let’s help Chloe reach the challenge goal that her Rotary District gave to her before she left. Cathy Vicini announced that we will host several club grant recipients at next weeks’ meeting and present them with their checks and hear about their good works in our community. This will be a great opportunity to connect with those we are helping. Karen Ball who gave $25 to Tim Fawcett’s Paul Harris Fellowship because he was the only Rotarian to attend Karen’s open house for her business. He also received the door prize. John Poremba saw an amazing sight on the 3rd hole of the Windsor golf course when Past President Steve Olson made an eagle putt (that’s 2-under par). John put $10 in the cup and Steve matched it. Jack Abercrombie has a granddaughter playing semi-pro football for the Minneapolis team and she did a “pick six” by intercepting a pass and returning it for a touchdown during one of their games. Jack spiked the football and gave $10 for the celebration. That was a priceless moment, so Jack should be extra proud and maybe donate another $10 next week. Jeff Gospe presented a Rotary flag from the only Rotary club in the country of Myanmar (formerly known as Burma) with a 60-million population. It figures that if Jeff is going anywhere in the world, he will find a Rotary club to do a make-up! He was happy to donate $100 to his kid’s PHF. Cathy Vicini said her husband had a recent birthday, but would not say what number it was. But, she did donate $50 to his PHF. Was that a clue? Past President Jeanne Levin contributed $10 to the cause for her short history lesson on Rotary’s former title for the office of President Elect Nominee, which used to be called President Elect Elect – before someone shortened it to PEE and got in hot water (so-to-speak). Bob Sorensen overjoyed from vacationing all over the country and having a great time at jazz festivals and seeing family that he shared $100 with the Club Foundation’s Scholarship Fund. Today, we welcomed new member, Steve Baime, and his wife Michele to our club. Steve is a retired educator from Carlsbad, CA who retired to Santa Rosa on October 31, 2014. He looks forward to being active in our club and meeting all of us. Steve received his red badge from President Mark. Steve was sponsored by Julia Parranto. 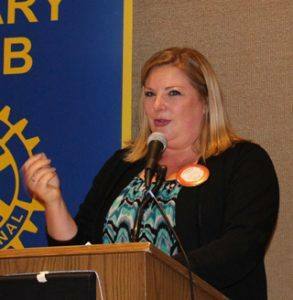 Our speaker was Steve Lyman, Director of Sales for the Santa Rosa Chamber of Commerce. He was introduced by his long-time friend, our own Wayne Rowlands. Steve gave us a well-presented summary (with plenty of details) about the SRCC since its beginnings in 1906 when it was tasked with rebuilding the city after the big earthquake that leveled Santa Rosa that year. Steve described present day Chamber activities to give us a scope of how active they are and how they are accomplishing their mission of promoting and advocating for their members in the creation of a vibrant local economy. In 1923, Frank Doyle (of Exchange Bank fame) was the president of the SRCC and he was very involved in helping to build the Golden Gate Bridge. Frank drove the first automobile over the completed bridge and that car rests in the downtown Exchange Bank building. In 1929, the SRCC deeded land to Santa Rosa Junior College for its Santa Rosa campus. Today, the SRCC advocates before local and state governments and has a CPAC with its own fundraising sources so that it does not take from member dues. The Chamber successfully saw the completion of the Sonoma County airport runway extension, after five years of actively promoting it. Now, there will be even more tourism to arrive, and commerce, too. He didn’t say anything about jet noise. The Chamber has a “Visit Santa Rosa.com” program with some taxpayer funding (‘bed tax’), to promote tourism from other distant areas. And, the Chamber started a young person network (“YPN”) to showcase about 300 young business owners in the 21 – 40 age group so they can make connections for doing business. The Chamber also manages the California Welcome Center which refers tourists to restaurants and wineries – about 43,000 visitors per year connect with the Welcome Center. Steve pointed out many other programs operating in the Santa Rosa area by the Chamber – the BEST (stands for Building Economic Success Together) program for the food and the high tech industries; the WHEEL program for employees learning to speak English, the Algebra Academy to teach 8th and 9th graders so they can get a grip on that before hitting high school. And, last, but not least, is LSR (Leadership Santa Rosa) which is on its 31st class now. The Chamber has 975 members now and looks to break 1,000 soon. President Mark thanked (and did NOT fine) all volunteers serving at today’s meeting – the twin greeters, Gesine Franchetti and Ann Gospe for ticket sales, Bart Eddy as ticker taker, Robbie Fouts as Raffle Meister, Cathy Vicini as Ms. Mic and yours truly as scribe. 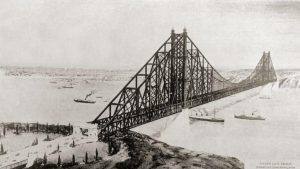 Every obstacle to the construction of the Golden Gate Bridge has been swept aside, every objector has been silenced, and the time has come when the great bridge project will be “put over”, Tomas Box, chairman of the Bridge of the Golden Gate Association, told the Santa Rosa Rotary Club yesterday. 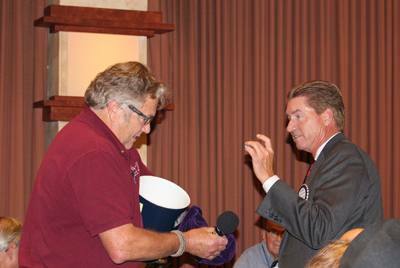 Rotary member Frank P. Doyle is a member of the executive committee. Box, who 36 years ago was visualizing the possibility of a gigantic structure from San Francisco to Marin County, told of studies that showed that no toll bridge has ever failed to pay. Figured on the basis of projected traffic flow, the San Francisco-Marin County structure would pay for itself in five years. “The breaking down of religious barriers in the United States, and in the world, is the greatest single accomplishment of Rotary International,” stated Dr. Charles Barker. As an example, he illustrated the method of membership in Rotary. When a man is proposed for membership in the Rotary Club, there are three things on which he is investigated, namely: His moral life, a measurable success in business, and his methods of doing business. His religious beliefs never enter into consideration by Rotary Club members. There was quite the competition for the Automobile Retailing classification. 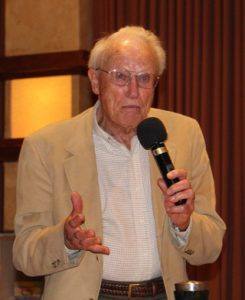 The Board ultimately selected George Schilling over E. Rodgera and J. Girrens. Applicants in Photography and Plumbing also rejected by the Board, but no reason appeared in the minutes. The current club charitable project is a swimming tank, although the location was not identified.